Maybe you're starting a travel blog or perhaps you're wondering how I fund my travels. Either way, today I'm going to dive into HOW I make money from travel blogging. First off, successful travel bloggers never have one income stream. There seems to be almost unlimited ways to make money by travel blogging. This list includes the ways that I do it, but there are other ways as well. Whether it is a sponsored social post or a blog article, this is one of the most common ways to make money as a travel blogger. In my case, I have done these by working with agencies that represent the brand or the brand directly. Generally, there is a good amount of creative freedom as to what to post but the brand will want their product clearly shown or portrayed in the image/article. This is an example of a sponsored post with Frontera Wine in which I was paid $200. For sponsored brand work on social, a travel blogger should be paid based on the following formula: Follower count on social platform/100 = Rate per post. For example, if a blogger has 50,000 followers they would be paid $500 per sponsored post. Yes, $500 for a single photo on Instagram! For sponsored articles on a blog, the price varies, however, what I charge is .50 cents per estimated view. If an average article is read by 500 people, the blogger should charge $250. The formula for this would be: Estimated # of readers x .50 cents per reader = Cost for sponsored article. Many travel bloggers, including myself, will work with travel brands to write articles for them. For example, I have written articles for the Intrepid Travel blog in the past. This article cannot appear on my site as the brand has paid for my work. The rate this pays can vary tremendously depending on the publication. I've heard of bloggers being paid as little as $50 (which you should NOT agree to!) and as much as $1,000. It truly depends on how talented you are as a writer, your credentials, the publications budget, and how interested they are in your pitch. To see examples of my published freelance work, click here. Affiliate revenue is money that comes through recommended links on your site. For example, in my article "How to Pack for a Round the World Trip", most of the items I link to are part of an affiliate program. As a general rule of thumb, I ONLY link to products that I personally use and love. This is the best way to use an affiliate program because you're recommending something you've used and can keep the trust of your readers. This is an example of a dress in which I linked to RewardStyle and earn commission from sales. I posted this on my instagram and when a sale is made through my link, I make $15.96 per sale. To get the dress click here. Some of the most popular affiliate programs are with Amazon, RewardStyle, and Conversant. The amount of money that is made through affiliate programs depends on how large your following and traffic are. Click the photo below to see my Amazon Store. 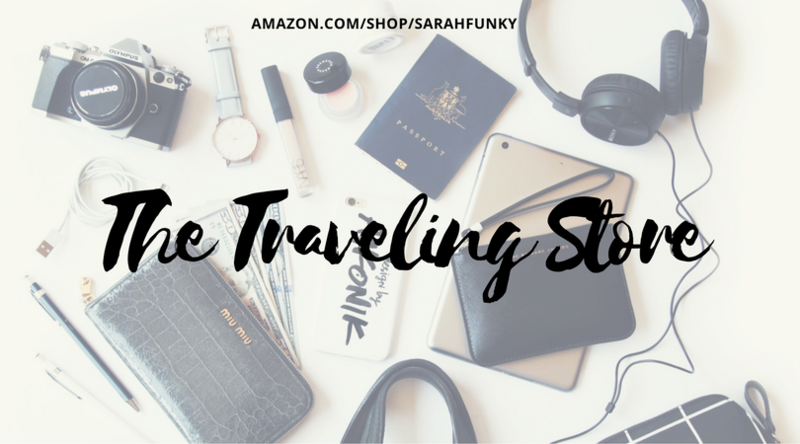 This is a collection of items that I've used during my travels and recommend, I make affiliate revenue off of all sales. You probably won't start making money through this way until your site has over 10,000 monthly visitors and your social handles have over 20,000 followers, from my experience. Using Google Adsense is an easy way to optimize a site for receiving ads that are relevant to the reader. Ad's can be cost per click or cost per view. This means that you will either get paid when a reader see's the ad or clicks through to it. It generally depends on how the advertiser has been set up with Google. Once again, it is not really possible to make money this way unless your website traffic is over 10,000 monthly views or you have over 20,000 subscribers on YouTube. Sometimes brands will like your video or photo so much that they want to use it in a marketing campaign. When this happens, they pay well. For example, Carnival Cruises wanted to use 3 seconds of a zip-lining video I made in Puerto Rico and paid me $500 to use it. This is one of the best ways to make money because, if done correctly, the profit margins can be large. Many travel bloggers will create custom merchandise, photo filters, or guide books that they sell on their site. One of the way's I've made money through this product sales is by creating a course on how to travel the world & make money doing it. When someone buys a course, I get almost all of the profit, which is great because it took two months of straight focused work to put it together! This is a wildcard and almost impossible to to plan ahead for but occasionally sites will reach out and ask me to put a link to their website at the bottom of a relevant blog post. This is paid well given the fact that it only takes about 5 minutes to complete. In the past, I've been paid as much as $115 to put a link to another site at the bottom of a post. Of course, I only link if I support the company and find that it is relevant to the topic of the article. If there is a brand that aligns well with my site or I think needs content for their social channels or blog, I'll pitch them on it. For example, a year ago I worked with a food app to get their platform up and running. They would pay me $250 a week to post five food related photos that I took on their app. Another example of this would be working with tourism boards or worldwide travel companies to do location or tour photography, videos, or articles. In the past, this has involved me pitching the company on a coverage idea, then they would pay me to capture moments on film, edit them beautifully, and then I would hand over all of the assets to them for their marketing use. This can pay several thousand dollars. There you have it, those are the eight ways that I have made money from travel blogging. However, there are many other ways that I've seen bloggers do it including running their own tours, doing vacations with followers, opening hostels, and much more. If this article was helpful to you, please share it with your blogger friends. Let's get the blogger community more open to sharing so that we all grow together!